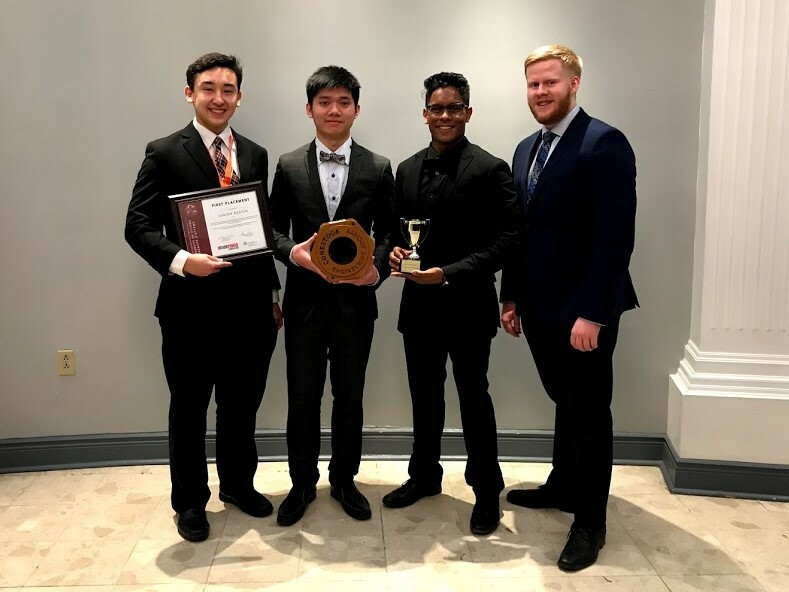 Four students in Conestoga’s Bachelor of Engineering - Mechanical Systems Engineering degree program will represent Ontario at the Canadian Engineering Competition (CEC) to be held March 8 to 11 at Ryerson University. Mechancial Systems Engineering degree students Sharaz Arfeen, Samuel Delattre, Coel Hofstetter and Nicholas Abraham (Pardede) will represent Canada at the Canadian Engineering Competition in March. The Conestoga team qualified after winning first place in the Junior Design challenge at the Ontario Engineering Competition. Sharaz Arfeen, Samuel Delattre, Coel Hofstetter and Nicholas Abraham (Pardede) were invited to the CEC after winning first place in the Junior Design challenge at the Ontario Engineering Competition (OEC). They placed ahead of teams from Laurentian University and Carlton University, who finished in second and third place respectively. The CEC was established in 1985 and welcomes the most talented engineering students from across the country who compete in eight categories. Students who qualify to participate must first win an initial contest at their institution and then win at their respective regional competitions. In March, the CEC will welcome the top 150 undergraduate engineering students from Ontario, Quebec, and the regions of Atlantic and western Canada. For the Junior Design contest at the CEC, the Conestoga team will be given a real-world problem and must develop a practical solution within a limited amount of time using a limited number of materials. After fabricating a prototype, the design must be presented to judges who are drawn from related industries and academia. Conestoga is the only college in Ontario to deliver accredited engineering degree programs. The Mechanical Systems Engineering degree, accredited in 2010, and the Electronic Systems Engineering degree, accredited in 2014, both feature small classes, project-based learning and co-op work experience to prepare graduates for success in their chosen fields. The Bachelor of Engineering - Building Systems Engineering program is the newest professional engineering degree offering in the School of Engineering and Information Technology and is delivered at the honours level. Visit the Engineering program pages for more information.